We recommend our guests stay in Ol Pejeta Conservancy both to acclimatise and to have an amazing experience on safari. 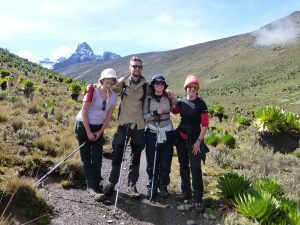 “We had an unforgettable trip arranged by Lucy and the team at Kenya Treks. We were met at the airport and whisked to a smaller airfield where we took a Cessna plane to Nanyuki to spend three incredible days at Porini Rhino safari camp in Ol Pejeta Conservancy with welcoming and knowledgeable guides who knew everything about the animals and plants and even taught us the Maasai traditional dance. We then headed out of the Conservancy to meet Lucy, the Johns, James, Jackson and the porters who would guide us up the most beautiful Chogoria route. The hike took us 4 days through stunning scenery, staying at Lake Ellis and Lake Michaelson. It was made even more enjoyable because of the home comforts that Kenya Treks provide, such as mattresses in the tent, tea and biscuits in the fully set up camp once you arrive after a day’s hiking and even a proper loo! The team were all very friendly and helpful throughout. We had the mountain totally to ourselves on our 3 day ascent and with the help of the guides our whole group made it to the summit successfully. I couldn’t recommend Kenya Treks highly enough and thank you to Lucy and the team for a once in a lifetime trip”. « Snow on the Equator!